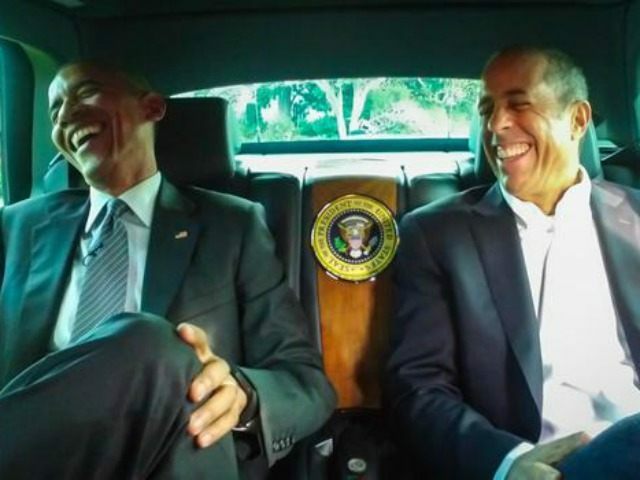 President Obama is the featured guest in the season seven premiere of comedian Jerry Seinfeld’s web series “Comedians In Cars Getting Coffee,” released Thursday. The wide-ranging, but soft, interview was light on politics, focusing more on the everyday perks and obstacles in the commander-in-chief’s life. “I always wanted to be in a show about nothing and here I am,” Obama said early in the show. “There’s nothing that’s more nothing than this,” Seinfeld responded. Obama — who has received criticism in the past for participating in comedy and reality shows — offered details about his life and enjoyed some light banter with one of the country’s most successful comedians. “Anything O’rama is fun,” Seinfeld quipped. Additionally, Obama conceded that cursing helps him relieve stress. “I curse,” Obama said when Seinfeld asked if it helps with his stress level. Obama further revealed that he believes “a pretty sizable percentage” of world leaders are out of their minds. “Part of what happens with these guys is the longer they stay in office, the more likely that is to happen,” he said. “Because a lot of players, a lot of specialization, a lot of hitting, a lot of attrition. But then every once in awhile you’ll see an opening. So you’re hitting the line and you’ll get one yard, try a play and get sacked. Now it’s like third and 15 — and you have to punt a lot — but every once and awhile you’ll see a hole and then its open field,” he said.